Discussion in 'Chit-chat' started by guardian, Feb 22, 2015.
pet, no cats (sorry BC2Tweak), nor any dogs or budgies I want something different." The pet shop owner thinks for a while and says to him that he’s got this talking centipede. "REALLY?" Says the bloke "How much?" The owner thinks for a while and says to him that the talking centipede is only $29.99. The bloke pays the money and takes his new pet home. the centipede says nothing!! Figuring it must be tired from the journey he decides to leave it for an hour and try again later. and get his money back. An hour later the man opens the match box and says "Last time Nigel, fancy going to the pub for a few beers?" The centipede says "I heard you the first time ya whacker! I'm still putting my shoes on!!!" Lol awesome joke mate. Just the kind which would make a day. 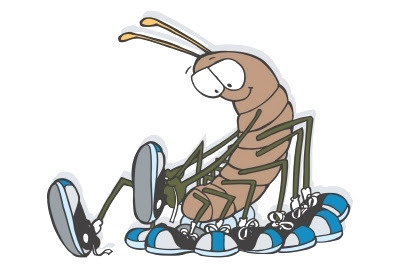 That means at minimum a centipede needs 3 hours to wear his shoes. what goes 99 clomp, 99 clomp, 99 clomp? insomnic and ahmadkhaje like this.